It's important that all safety measures are taken into consideration when using scaffolding. With effective training the risks of serious or fatal injury can be dramatically reduced for those who work with scaffold equipment. Safety regulations such as ensuring that the scaffold equipment is in proper working order before use, and regular maintenance checks also increase the safety of working with scaffolds. OSHA requires employers to adhere to certain regulations to protect workers from injuries, and you can refer to their official website for more information about those regulations including those regarding scaffolds. Workers compensation costs are reduced for companies when measures are taken to prevent accidents and injuries from happening. Employees are not the only ones needing to be kept safe around scaffolds. Visitors to a worksite wherein scaffolding are in use must be protected from accidents and injuries wherever possible too. Scaffold training goes a long way towards protecting everybody concerned. This will also protect your company from expensive lawsuits filed by persons injured at your workplace. Aside from the governmental safety regulations and avoiding lawsuits that make scaffold training a necessity in many cases: such training offers multiple benefits worth considering. Many insurance companies require that you and your employees complete a scaffold training course for coverage. The completion of a scaffold training course could also result in a reduction of your current insurance costs, even if such training is not required by your insurance carrier. Ask your insurance agent this. Having a workforce that has been properly trained in the use of scaffolding is something that potential investors will look to see if your company has provided to its employees. Scaffold training also looks good to the people and organizations that make assessments about the safety and productivity in workplaces. There are a number of resources available for scaffold training. There are scaffold industry sponsored conventions and training seminars that take place all over the US that you can attend to get the training you need. There are also online scaffold training courses and materials such as books, DVDs, and audio tapes that you might consider purchasing in order to get needed scaffolding training. To give you a start on finding scaffold training we have provided the following references for you to take a closer look into. Scaffold Industry Association, www.scaffold.org hosts an annual convention and is a good resource for training courses and information on scaffold training. The Scaffold Training Institute based in Texas, offers three-day certification courses for trainers and other scaffold training related courses. Find more details on their website, www.scaffoldtraining.com. Here is a resource for OSHA safety scaffold training materials like trainers manuals, employee training booklets, CD, DVDs, and safety posters, www.osha-safety-training.net. This article has highlighted many of the benefits of scaffold training for you to consider. 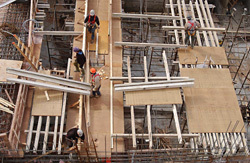 The wide variety of scaffold training resources that are made available and can easily be located using the internet makes scaffold training a cost-effective approach for companies to meet regulations, improves safety in the workplace, and enhances worker skills and their asset to the company.